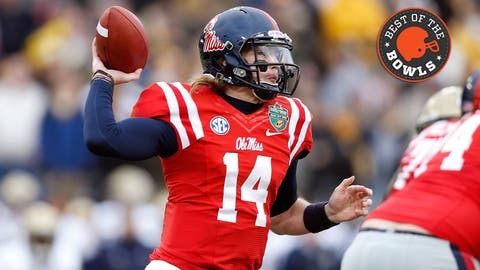 Bo Wallace earned the Music City Bowl MVP award in Ole Miss' win. Rooting for the man they call Dr. Bo was the ultimate Ole Miss duality in 2013. Bo Wallace, the Rebs’ sometimes-loved and sometimes-despised quarterback, could be highly competent for extended stretches, spectacular in spurts and self-defeating at the worst times. The Music City Bowl, in some convoluted way, explained all of this. The Rebels beat Georgia Tech 25-17, finishing the season at 8-5, and the first three quarters or so were vintage Dr. Bo. He made sure the Rebs struck first, running in from 17 yards out on Ole Miss’ opening drive. Later, he hit Donte Moncrief for a 28-yard TD and then, early in the third quarter, added another rushing touchdown. This is the good Wallace, the QB who gives citizens of the Grove just a bit of hope in their football team and the guy who makes Rebels fans fall in love again and again after yet another heartbreak. Dr. Bo Wallace has the medicine you need, Ole Miss. They can't stop Bo Wallace for nothing. There are a few perpetual Wallace bashers among the believers, but it’s mostly love when he’s running through opposing defenses and his passes nestle into the palms of Moncrief and Laquon Treadwell. Let me ask one more time… Where are all of the bo Wallace haters at?? Y'all hated him a month ago!!! You ever hear of that jewel about sleeping dogs and waking them and stuff? With 14:43 left in the game and Ole Miss leading 23-10, Wallace was picked by Georgia Tech’s D.J. White. On the following play, Vad Lee hit Darren Walker for 72 yards and a touchdown. Ole Miss 23, Georgia Tech 17. Hey Rebs, how you like your boy Bo now? I think Bo Wallace still has time to blow this! And that's the Bo Wallace I was afraid to put my money on. OK, well that wasn’t as terrible as I thought it was going to be. Wait – we’re not done? This is what it’s like to be an Ole Miss fan in 2013, apparently. Great highs, many lows and you ride through them all. It’s striking to see the level of discourse surrounding a quarterback who, in this very bowl game, broke the program’s single-season completions record that Eli Manning set in 2002. I suspect much of that discourse is driven by the dismal performance Wallace put forth against Mississippi State in the regular-season finale – 26 of 40, 182 yards, zero touchdowns, three interceptions – but who knows? It never seems to be any one instance with Dr. Bo. As time wound down in the fourth quarter and the next two Ole Miss drives resulted in a punt and blocked field goal, tension grew among the Ole Miss crowd. It was as if the first three quarters of the Music City Bowl – a period of Dr. Bo brilliance, remember – never existed and everyone reverted back into their shells, into a place where if they were going to be burned by Bo, they were going to beat the pain to the gut-punch. So here it was then, Rebs leading 25-17 after a GT safety, 2:29 left, third-and-13 at Ole Miss’ 42-yard line and the Rebs staring at a punt. They’d likely run the ball, forcing the Yellow Jackets to use their second timeout and then go the length of the field to score a touchdown and convert a two-point conversion. That would have been the safest play. Would any Ole Miss fan, at this point, choose to put the ball in Wallace’s hands? Hell no. So, of course, that’s what Ole Miss did. Wallace connected with Treadwell for 27 yards and sent Oxford back to its high place, a place of peace and goodwill towards its quarterback. Wallace’s final Music City Bowl line: 22 of 32 passing for 256 yards, one TD and one interception; 13 carries for 86 yards rushing and two TDs. By the time Wallace returns to Oxford for his senior season, will all of this be forgotten by Ole Miss fans? Will they be back to doubting Dr. Bo instead of hoping maybe, just maybe, there’s one consistently good season in there before he heads off for good? Probably. Some Rebels fans are already dreaming of DeVante Kincade, a four-star recruit who redshirted this season, winning the job in camp. But maybe that’s the way it ought to be. What would Dr. Bo’s Ole Miss story be without a bit of dissension, anyway?